Infinite Disorder : why legacy shortcut keys? Something that has puzzled me for many years- why was the control key chosen as a primary shortcut key for windows and *nix? Why would you forcibly abuse pinky-fingers around the world? It makes us all slower, less accurate and generally just hurts me. Apple knows theres no reason for this, which is why their version of the control key (the apple key) is positioned right next to the spacebar. I’m sure microsoft’s excuse is ‘well its too late to change, everyone is acccustomed to using the control key’. Well this is certainly not true for me. 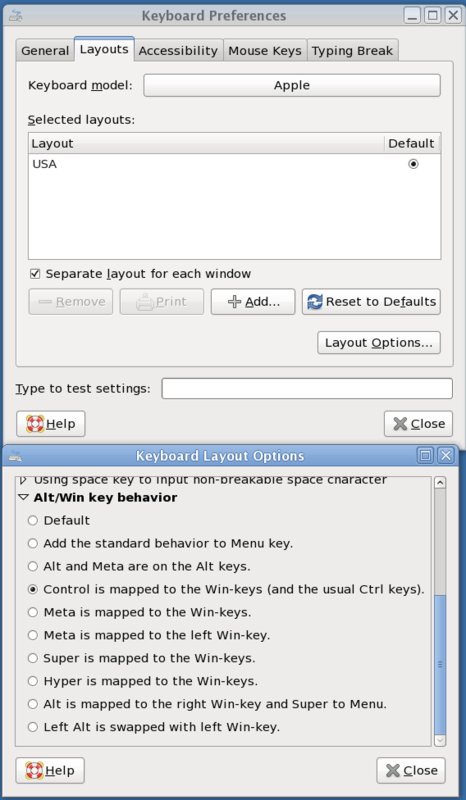 One reason why I love running linux is I can map anything I want to any key. Posted by admin on Thursday, May 7, 2009, at 4:14 pm. Filed under software. Follow any responses to this post with its comments RSS feed. You can post a comment or trackback from your blog. The problem I was experiencing disappeared as soon as I reimaged with to fedora core 11; I continue to monitor the bug but the cause may forever remain a mystery.